Steven (Chicagoland, United States) on 1 December 2009 in Cityscape & Urban and Portfolio. Young Hall, built in 1878, is the first permanent surviving building of the Lake Forest College institution. This exuberant, tall, yellow-brick Second Empire "College Hall" for its first century was built following the 1877 fire in the New Hotel building at about 401 North Mayflower, just southeast of the campus. 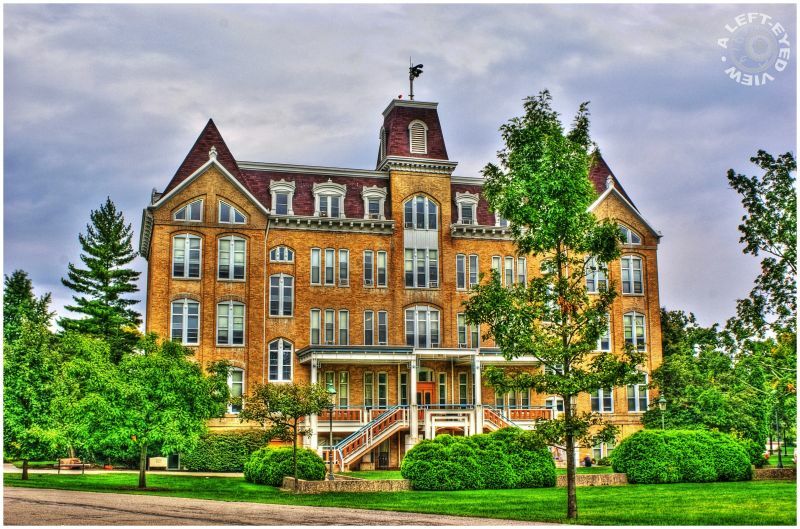 This academic and residential building was donated originally by the Charles B. Farwell family, Mrs. Farwell having given the impetus for re-starting the college for her daughter, Anna Farwell '80, later Mrs. Reginald DeKoven, a noted author. The building was re-named in memory of the lead donor for the 1981-82 renovation, alumnus Irwin L. Young, class of 1926. This five-story building is the tallest building in the City of Lake Forest, Illinois. Superb... thanks for the background info :). Yet a building beautiful and a good composition, bravo! Beautiful building and great HDR. It seems strange that there are no people in this photo. They were probably still sleeping off Friday night! This HDR stuff reminds me of air-brush paintings, they way the colors just pop off the page - visually stunning. Did you use a focal length under 25mm? The sides of the building appear distorted, or maybe the building is absorbing the intoxicated effects of its inhabitants! Another great HDR Steve (building looks pretty straight to me), Lake Forest must be a fairly normal sort of place if this is the tallest building. Great building, the hdr treatment makes it shine. Well done! I really like the hdr vivid coloration on this one. An awesome image. I really like the yellow brick and the processing that makes it pop.